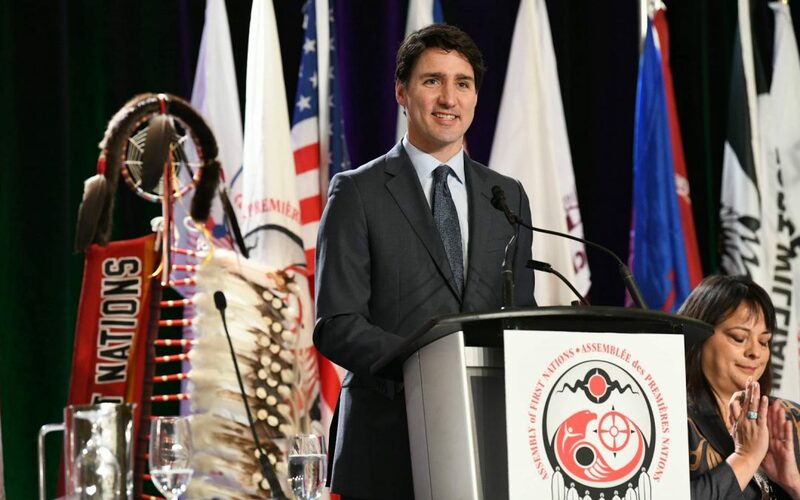 Prime Minister Justin Trudeau took the podium to address the Assembly of First Nations in Ottawa Monday. This is the fourth time he has joined the Special Chief’s Assembly event. In his speech, Trudeau spent most of the time highlighting the positive changes that his government brought forward in his three years of power. Trudeau adds that his government plans to lift all advisories by 2021. He also explained that one of the greatest achievements are the changes to the Child Welfare System. This comes after a statement by Minister of Indigenous Services, Jane Philpott saying the Government of Canada will introduce federal child welfare legislature co-developed in partnership with Indigenous communities and leaders. The tone of the address took a turn when the question and answer segment started. Chief Judy Wilson from Neskonlith Indian Band, which is 50 kilometers north-east of Kamloops in British Columbia requested that Trudeau and his ministers acknowledge that they are on “unceded Algonquin territory” in the future. Chief Wilson continued by challenging Trudeau about the lack of consent regarding the Trans Mountain Pipelines. “There was no consent on that, and you can’t count a few IBAs (Impact Benefit Agreements) that you’ve done with some of the communities as consent,” pressed Chief Wilson. She added that the pipeline takes up 513 kilometers of their territory. Trudeau added that he agrees this is a process and that he apologizes for not consulting more communities. “The process of achieving consent, the process of respect and partnership means engaging in real substantiating conversations, listening to concerns and responding to those concerns,” explained Trudeau. The Prime Minister spent just over 15 minutes taking questions, but there was a line of about 20 remaining people who wanted to get answers. The afternoon wrapped up by Trudeau being presented with a buckskin vest, with floral beading.